Adobe Flash Plugin is an essential package for every Linux desktop. It adds functionality to the web browser to play multimedia contents. Fedora 23, the most recent version of Fedora Linux does not come with this Adobe Flash Plugin by default. We need to install Flash Plugin on Fedora 23 manually. 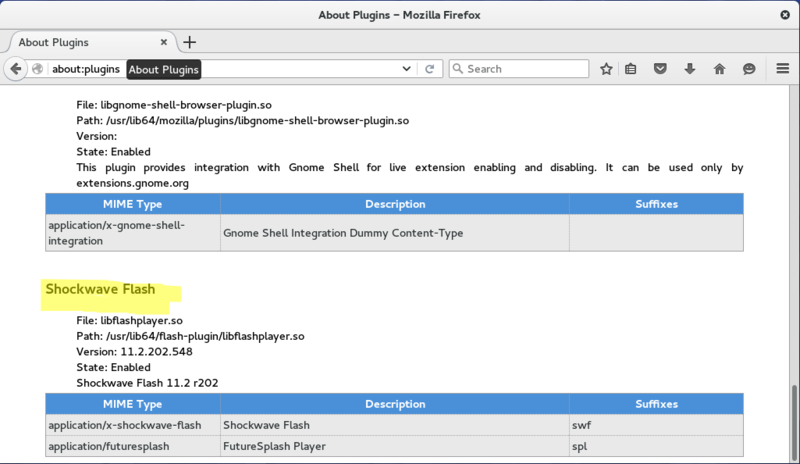 There are several methods to install Flash Plugin on Fedora 23. The easiest and convenient way to install Flash on Fedora is using Fedy. Fedy provides an easier way to install various programs on Fedora 23. See how to install Fedy on Fedora 23 if you don’t have it yet. Once Fedy installed, run it and click Install button next to Adobe Flash. It doesn’t take too much efforts to install Flash Plugin using Fedy. If you don’t want to use Fedy and prefer Terminal command to install Flash, the following steps should do. Use the following command to add the adobe flash repository to Fedora 23. Once installed, you can check if Adobe Flash plugin is installed correctly. Open Firefox and type “about:plugins” without quotes. You should see Shockwave Flash listed there. Thanks for reading this how to install Adobe Flash on Fedora 23 tutorial. Please consider share this post if you think this useful. Cheers.